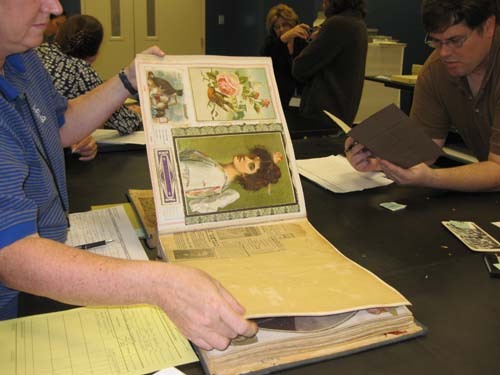 Preservation - The activities an archives undertakes to extend the life of its holdings. Conservation - The physical stabilization or treatment of individual items. 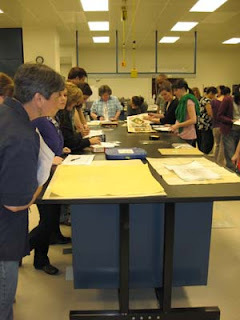 Led by Georgia Archives staff members Christine Wiseman (Preservation Services Manager) and Tina Seetoo (Conservator), our class learned the basics of archival preservation and one very important lesson: preservation (at its very best) = preventative medicine. Nothing lasts forever. Preservation is the process of stalling the deterioration of an artifact. Everything from what the artifact is made of to the condition in which it is found (at which point preservation can begin), to the resources that can be expended to maintain its condition, determine how long that process can ward off the inevitable. 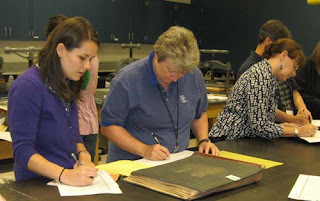 Armed with extra time to consider the options, archivists can make informed decisions about how to secure the legacy of a particular artifact or entire collection. 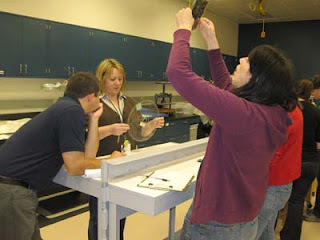 Right: Classmates examining "mystery" objects in the conservation lab. Now, this next observation is pretty obvious and in many ways we've been talking about this in class all week, but when I heard one of the instructors make the point out loud today it really stuck with me. Christine said that the major challenge in an archives is patron use of the collections. In a museum, more often than not, objects are not something that visitors get to touch. The nature of the interaction, or lack thereof, between museum visitors and displays gives museum objects a level of protection that archival collections don't typically receive. Any way you slice it, handling a collection increases the risk that those documents won't be around for future researchers to handle. It is the job of the archivist to reduce this threat by providing the best environmental conditions, instructing users in best practices for handling, and knowing when to say when and removing original items from public use. Researchers are their own worst enemies . While taking it all in, I tried to hone in on tips and tricks of preservation that might aid the Russell Library in its move to the new special collections building. Certainly, the refresher course in environmental monitoring gear was useful in thinking about how to manage our new exhibit spaces from the start. And Christine has some particularly good tips for moving materials safely, since the Georgia Archives successfully executed their own move in 2003. All in all, another rewarding day! Tomorrow morning I start my mini-internship at the National Archives Southeast Regional Branch. More on that as things develop. Below: Shots of Jenny and I examining a 19th century scrapbook and making recommendations for preservation.